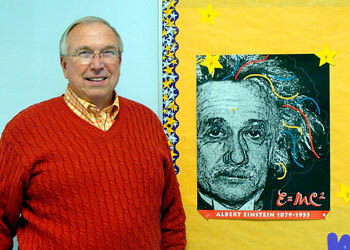 Onalaska science teacher Terry Carlton, a 1960 SHSU graduate, became the Alumni Association's 1000th life member in December. He will receive a special plaque, Alumni Garden brick and will be recognized at a Bearkat basketball game sometime this season. Over the past five years, Sam Houston State University’s Alumni Association has set a pace even the university’s quickly-growing enrollment can’t match. Essentially doubling in size and revenue, the association recently reached a milestone when it received its 1,000th life member. Terry Carlton, a 1960 SHSU graduate with a degree in physics who became the association’s 1,000th life member, said the decision to join the Alumni Association at that level came from all of the memories SHSU holds for him. As a member of the Esquires and charter member of the Delta Tau Delta fraternity, the friendships he made can’t be surpassed, Carlton said. After his military career, Carlton became a physics professor at Stephen F. Austin, teaching more than 10,000 students in his 20 years there. He recently returned to the profession, teaching chemistry and physics in Onalaska. He and his wife, Judy, currently live on a ranch outside of Groveton. They have a son and a daughter-in-law and two grandchildren. Though he said his loyalties have been split between SHSU and SFA, Carlton said he feels more at home at Sam after only four years than he did after more than 20 in Nacogdoches. Since Carlton became a life member of the Alumni Association in December, the total has risen to 1,024. This number is more than double the amount of life members the association had in 2005, when there were 485. The money from life memberships is placed into an endowment, which has grown from approximately $350,000 in 2005 to currently more than $800,000. "The Alumni Association receiving its 1,000th life member is a significant milestone that is a testament to the program's development,” said vice president for University Advancement Frank Holmes. “Overall membership has increased from less than 1,200 to more than 6,500, and the combined endowments for our alumni program have grown to nearly $2 million, which is larger than many other alumni associations at larger universities." Revenue generated from the endowment are used to offset operating costs for the Alumni Association, for such events as the Distinguished Alumni gala and regional receptions, as well as supports the association’s regional clubs, according to Vienne. Life memberships can be purchased for $1,000 for individuals and $1,500 for couples, $400 for senior citizens or recent graduates and $600 for joint senior citizens or joint recent graduates. In addition to a special “1,000th member” plaque, a brick will be placed in the Alumni Garden designating Carlton as the 1,000th life member. He also will be recognized during halftime at a Bearkat basketball game this season. For more information on becoming a life member, call the SHSU Alumni Relations office at 936.294.1841 or visit http://alumni.shsu.edu.